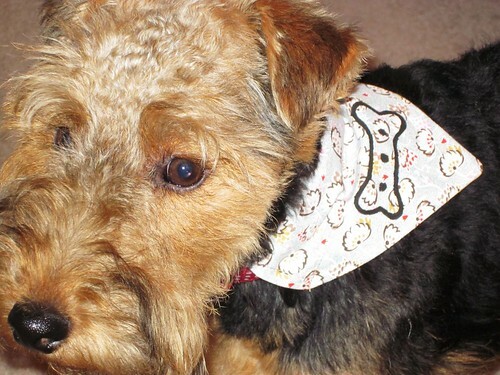 Dottie’s new neckerchief, originally uploaded by Edwyn UK. The Friday before last we had a very welcome visitor to our Spitalfields stall, Dottie the Welsh Terrier, and here she is in one of our neckerchiefs! Doesn’t she look gorgeous? This one is block printed on to the lovely ‘Petals’ V&A Fabric, the design of which is taken from a patchwork coverlet pieced from various early 19th century printed cottons. We love all four legged visitors to the stall, it makes our day, and they get fussed over by all the other stall holders, who are still talking about Dottie…. I think she stole their hearts!